I find it interesting that any of these tart cherries are grafted, up here they are all on their own root. But, moved out of the environment where they were produced, a difference in soil and disease would play a significant roll in needing them on a more hardy rootstock. Ive got 3 Juliet growing own roots on my boulevard tree form. Not sure how they will turn out tho. Will b interested in seeing how grafted changes their form. Thanks for the info. Now how could we find out if they hold US patents? I’m kind of excited. Looks like my Juliet has set a couple of hundred cherries. They are very early but hopefully I get to sample a few for the first time. One of my Juliet’s Is loaded with buds! I have a CJ with a few, and a Romeo that has a couple. I hope some of them set. It’s amazing how many buds they can produce. The Juliets are just showing white. I have three but only two with buds. There must be 30 flower buds in just one branch crotch area! I’m also excited, but for a different reason: I fenced in my Juliets and other Romance series cherries so the all deer can do is look at them. This fence will stay up for a few years until the plants are well above deer height. They are bush cherries. Are you training them to be single trunk trees or will you let them fruit high up only? My Juliet is over 4 feet tall and no blooms at all, while my little scrawny Romeo has about half dozen on it. 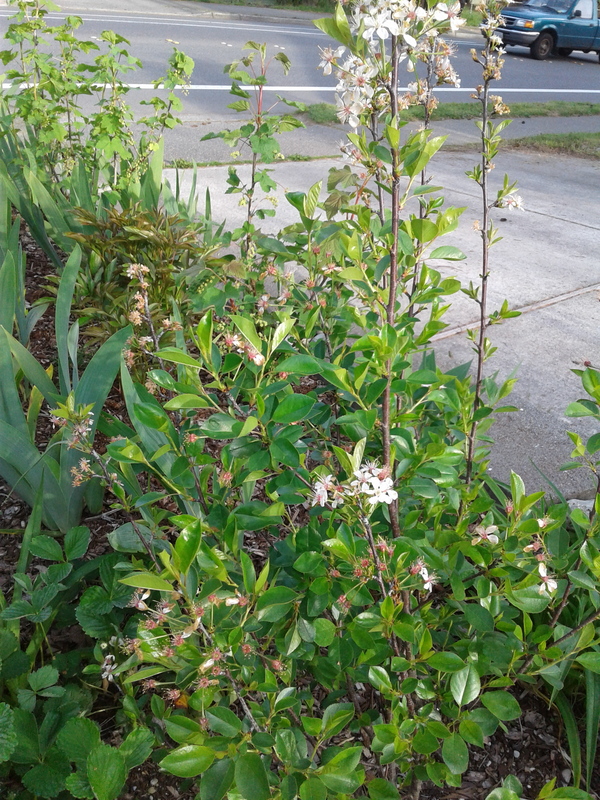 My Juliet Cherry planted last year. It’s done blooming for this season. If they get as big as @clarkinks’ trees it should be fine as a bush, most of the fruit looks out of deer range on his trees. In the short term though I only want to get good growth above deer height so I won’t need to yet again replant them. Please don’t forget to take pics of your deer barrier. I believe people here would want to see what they look like. It’s 8:40 so the light isn’t that good for a picture, but here’s some anyway. They are getting ready to open. You can see my other large Juliet in the back. These two are on their second season from Henry Fields. I have a third Juliet that died to the ground then set up a shoot two years ago after planting that season that’s doing well now, but still smaller than these. It has a single trunk growing straight up like a spruce tree, lol! It doesn’t have any flowers, but my Romeo and one of three CJ do. I wonder if that might help it set fruit? I put a bud of Monty on my CP. Anyone have photos of ripe Juliet cherries? How dark will they get. I sampled one of mine yesterday and it wasn’t ripe. It was fully red but not burgundy. Mine are still green. The bush is nice and healthy, and so are the cherries. I think more have fallen off. I might have about 15 cherries on this little bush. My Romeo aborted all the cherries, and I have about a dozen on CJ. It’s exciting. I already can’t wait for next year! If anyone gets enough juliet cherries to save and send me some seeds, I would appreciate it. Id like about 1lb of them if thats possible! Well darn it, the birds ate my cherries while they were green! I have about six left. I netted the bush today. I didn’t have many anyway but I want to taste them. It might even be those pesky chipmunks! They are all gone this morning. must have been the chipmunks. They have a way of getting into anything! Try rat traps with peanut butter?